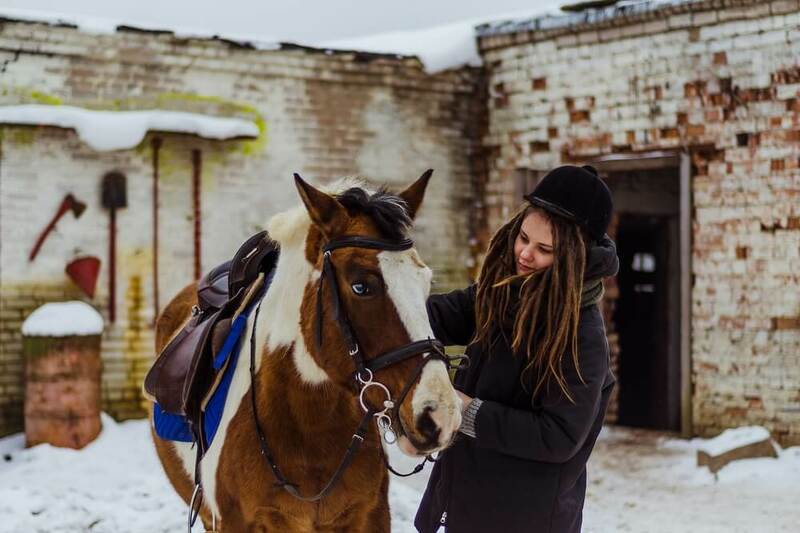 Wintertime is typically a less active time for horses as showing and riding activities slow down. 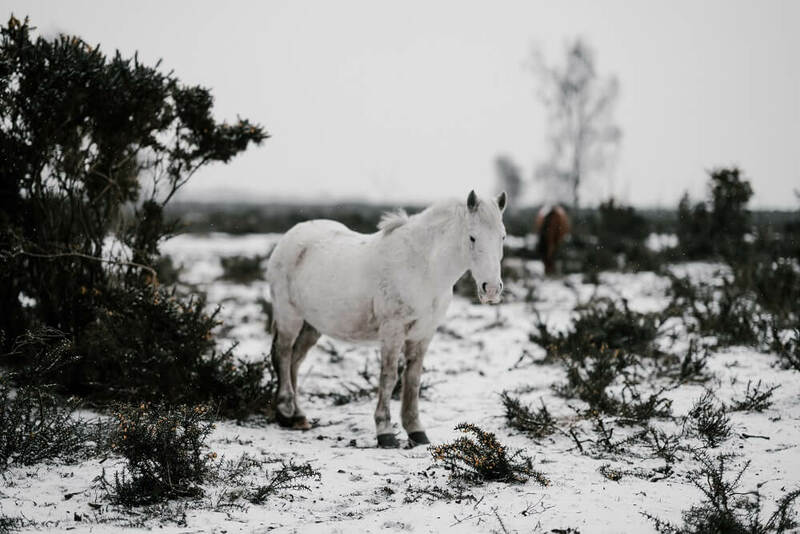 This reduction in activity level can also mean a need for reduced calories if your horse is stabled and does not need extra calories to cope with very cold weather. In the wintertime, grass is typically less abundant, so horses may need increased hay and other forage such as beet pulp. To feed your horse right through the winter months you must learn to correctly balance the essentials: nutrients, fiber and water. 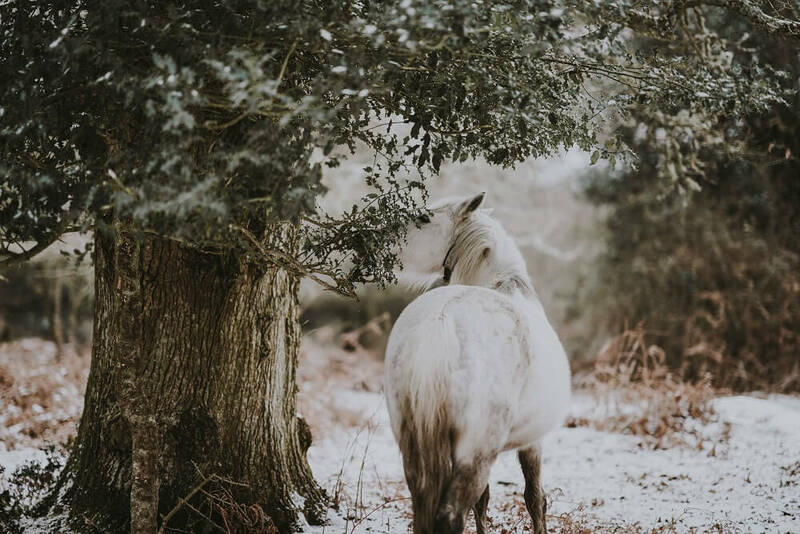 In this article, we share smart tips to help you feed your horse in winter. Read on to learn more. 4 What If My Horse Loses Weight In The Winter? 4.1 How Can You Tell If Your Horse Is Gaining Or Losing Weight? All year round, providing your horse with clean drinking water should always be your top priority. A horse at rest drinks a bare minimum of ten gallons of water daily. Horses who are engaged in training, pregnant mares, nursing foals or young horses who are still growing require more water. Staying properly hydrated helps your horse avoid developing colic. This is a real area of concern in the wintertime. During the winter months your horse may naturally consume less water due to feeling less thirsty. If he is not working and sweating, drinking may not be a priority for your horse. 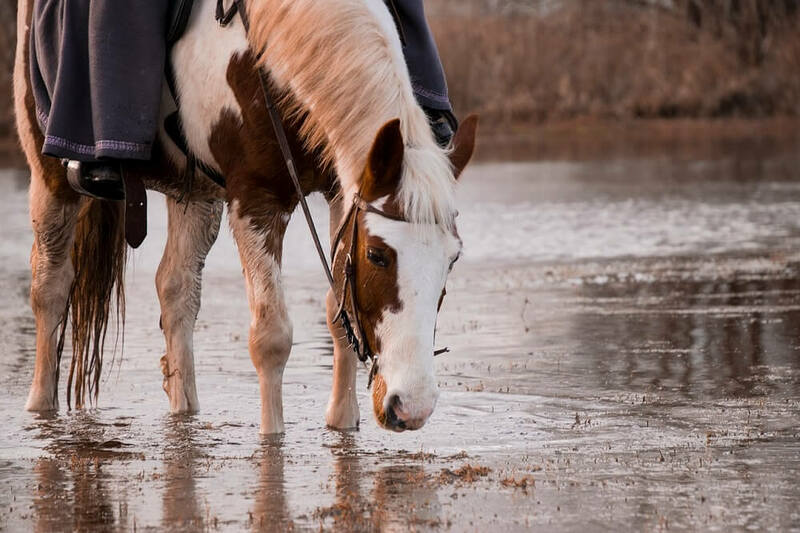 Additionally, in the wintertime getting water can be a challenge if your horse depends on natural water sources such as ponds and streams. Furthermore, horses tend to avoid drinking very cold water. Horses prefer water that is about room temperature (45-65 degrees Fahrenheit). In winter your horse may naturally drink less to avoid heat loss. Drinking cold water in the wintertime actually consumes energy and calories as the horse’s body must work to warm the water. For this reason, it’s a good idea to provide warm water in winter by using heated, insulated buckets. When a horse drinks plenty of water, the fiber in the digestive system stays properly hydrated and is less likely to cause intestinal blockage. Good hydration facilitates beneficial intestinal bacteria in their work of breaking down roughage so that it can pass smoothly through the large intestine. Fiber is absolutely essential to keep a horse’s digestive system working correctly. After water, fiber consumption is the second most important consideration for winter feeding. Horses should consume about 1.5% of their total body weight in fiber (hay, grass and beet pulp) every day. This means a one-thousand pound horse needs about fifteen pounds of hay daily. It is possible for a horse to eat as much as 3% of total body weight in fiber daily (i.e. 30 pounds of hay for a thousand-pound horse). If horses don’t receive ample fiber they will look for fiber in the environment. 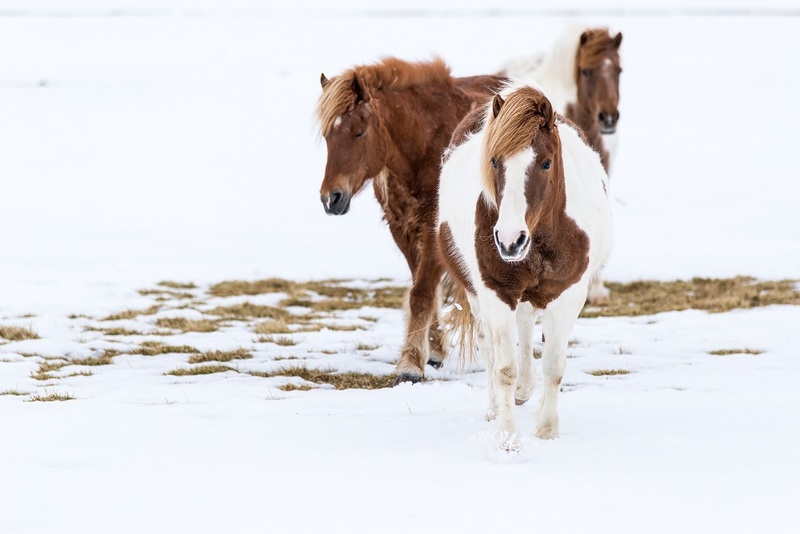 Horses in need of fiber may eat tree bark, wooden fence rails, particle board and stall bedding; therefore, it’s easy to see that free access to good hay is extremely important during cold weather. The reason for this is that the heat generated by hay digestion helps horses stay warm. As hay is digested both the physical process and the fermentation of the hay generate heat. This helps a horse maintain correct body temperature. Grain does not produce much heat during the process of digestion. During the winter months good nutrition is absolutely essential. A good quality feed that provides the correct balance of protein, vitamins and minerals helps repair and rebuild tissues that may have been damaged during the more active months of spring and summer. Pregnant and nursing mares, as well as young horses, need ample sources of essential nutrients for proper growth and development. Senior horses need good nutrition, properly formulated to maintain a healthy weight through the winter months. Luckily, there are many very good complete feed concentrates on the market today. Confer with your vet and read labels carefully to choose a product that is specifically designed to address the needs of your horse. For a fresher product that will help boost your horse’s immune system, look for locally produced feeds made of locally grown grains. Once you’ve chosen the right feed for your horse, be sure to feed the right amount. Again, talk with your vet and read product packaging instructions carefully to determine the right amount to feed your horse. Adjust as needed if your horse fails to maintain proper weight or puts on too much weight. What If My Horse Loses Weight In The Winter? Many horses drop weight during the winter months due to lack of pasture. This can also be caused by a shortage of hay or consuming hay that is not good quality. Either way, your horse may face challenges when it comes to getting the right caloric intake to maintain optimum body weight. If your horse’s weight loss is caused by lack of grazing or inadequate amounts of hay, the solution is easy. Increase the amount of hay you are feeding. Keeping a hay net filled with half a bale of hay in front of your horse at all times is a good way to ensure he always has access to hay. Adding soaked beet pulp to your horse’s feed also helps provide more fiber, as well as more water for better hydration. How Can You Tell If Your Horse Is Gaining Or Losing Weight? Of course, drastic changes in weight are obvious. It’s important to learn how to keep track of subtle changes from day-to-day in order to prevent these drastic changes. When you become very experienced, you’ll develop an “eye” for minute weight changes. In the meantime, develop a habit of measuring your horse with a weight tape and recording the result on a regular basis. This exercise will help you to notice any changes. Many horses who live mostly on pasture get through winter well with a three sided barn for protection from the elements. In this sort of setup you don’t need to worry about air circulation. If you keep your horse in a closed barn or stable, proper ventilation can be a challenge in the wintertime. Be sure to air out the barn or stable for half an hour or more on sunny days. Install ventilation fans if necessary to ensure proper air exchange without cold drafts. Taking this step helps keep the air healthy in your horse’s living environment throughout the winter months.